This sauce is so delicious! I served it on top of spiraled zucchini noodles, but it can go with any noodle of your choice. It can also be used for lasagna or a pasta casserole – very versatile. In a large pot, over medium-high heat, add the carrots, celery, onion, and red wine. Bring to a boil and cook for approximately 5 minutes to reduce the wine. Stir in the spices and mushrooms, and continue to cook for another 2 minutes. 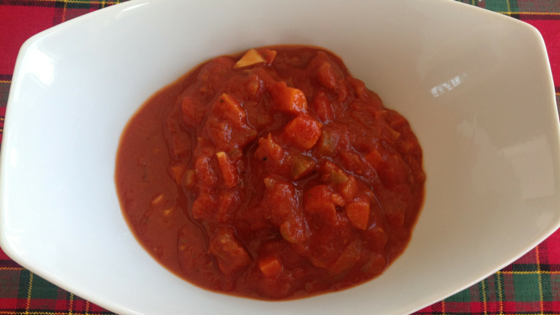 Stir in the whole tomatoes, lemon juice, and tomato paste. Bring to a boil, reduce heat to low and let simmer for 30 minutes, stirring occasionally. Note: The longer it simmers, the better it tastes, so if you have the time, let it simmer, uncovered, for a couple of hours. So delicious!